Welcome Salmon Arm ROOTSandBLUES Festival Volunteers! As a non-profit organization, we rely on the generous and kind support of our community. Check out our membership page for more information and benefits of becoming a member. Every year we have volunteers go above and beyond to help make an unforgettable weekend. Thank you for all your dedication and effort! 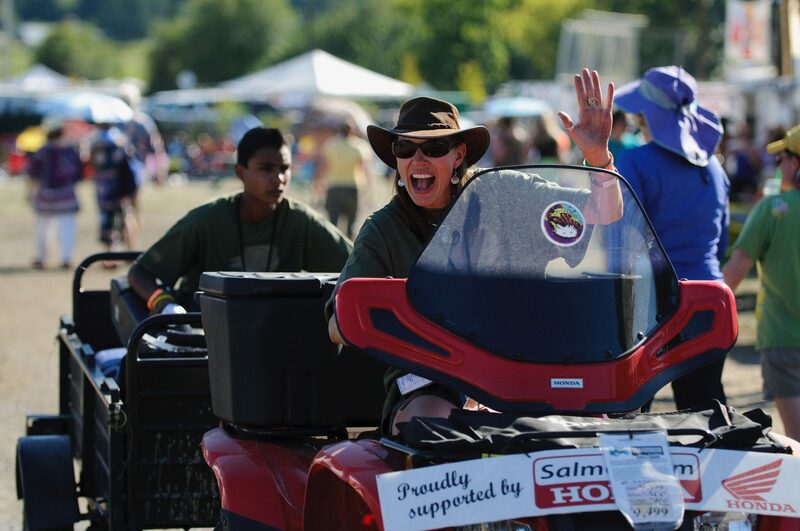 All volunteers are a host at Salmon Arm ROOTSandBLUES Festival. 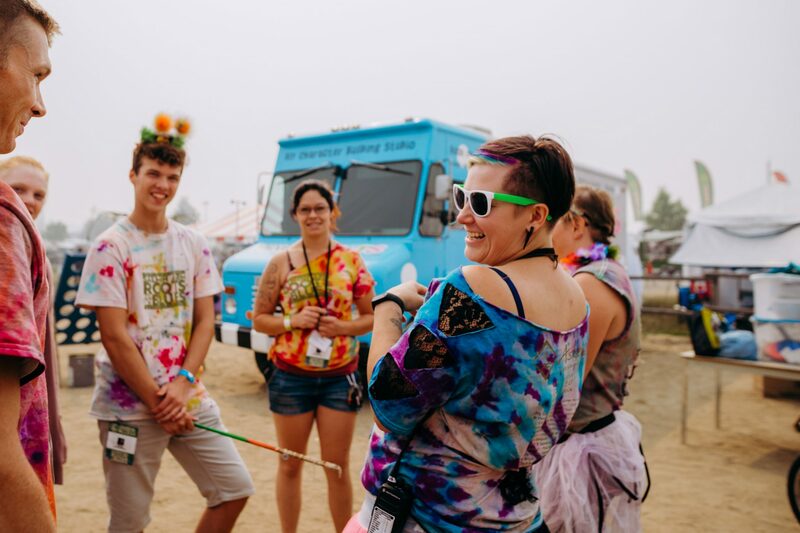 Help us spread a positive, passionate vibe throughout the festival by always being kind and helpful. Please Note: Volunteer hour requirements are based on the needs of the crew. Crews with 16 to 20 hour minimums means if needed you may be asked to do a longer shift. • Please send in your application before May 15, 2019 to confirm your volunteer area from the previous festival. After May 15th, all volunteers will be accepted on a first come, first serve basis and assigned. 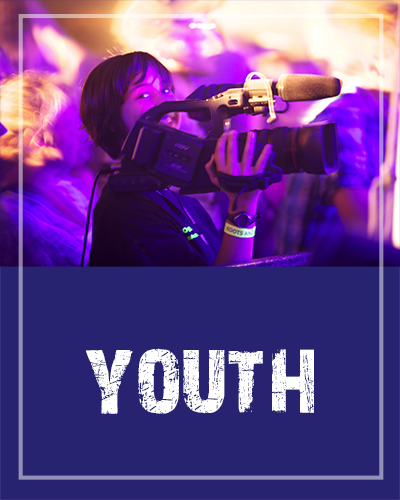 • It is Festival policy that all volunteers between the ages of 14 and 18 must be the children of an active volunteer or be sponsored by an active adult volunteer who will take responsibility for them. 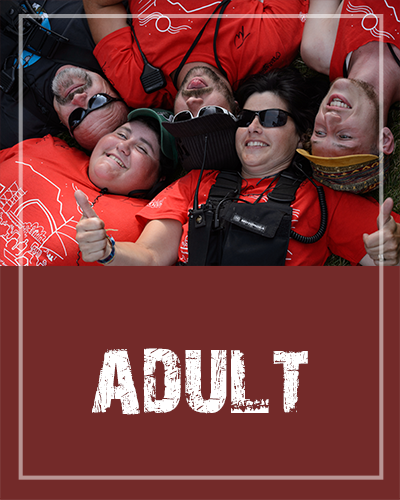 The Festival reserves the right to determine who will be acceptable as responsible adults. The parent or responsible adult must agree to the Wavier and Release of Liability form before a minor is formally assigned to a crew. • Volunteers under the age of 19 must be accompanied to the volunteer party by their volunteer sponsor. We have the utmost respect for the skills, time and passion volunteers bring to the festival. The festival offers weekend tent only camping to volunteers for the discounted rate of $30 for the weekend. Volunteers can reserve and pay for a volunteer camping spot by calling 250-833-4096 or stopping by 541 3rd Street SW, Salmon Arm. Camping is on a first come first serve basis, tents only, no showers, no pets but there will be water stations. The campsite is located in Blackburn Park, across from the regular festival campsite. No vehicles are permitted on the campsite however volunteer parking passes are available for the volunteer parking lot. If you wish to bring a camping trailer, please purchase regular camping at regular prices on our website. 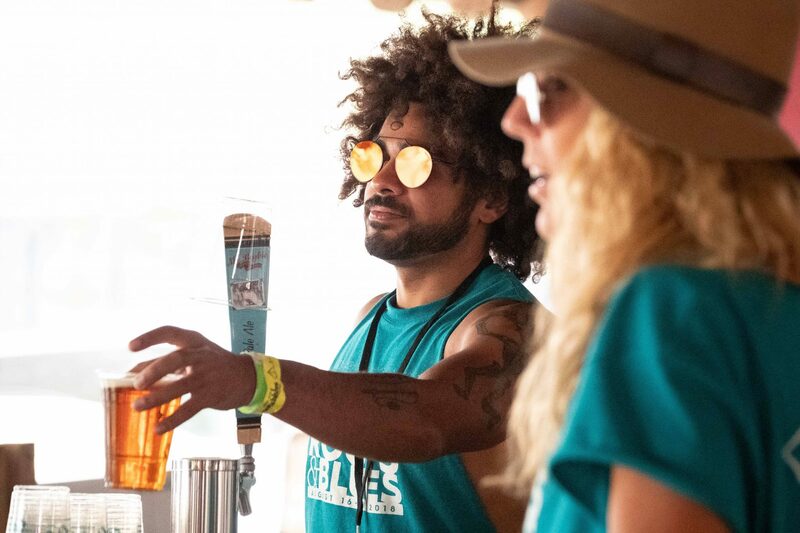 ROOTSandBLUES apologizes for being unable to accommodate a special rate for volunteers wishing to use a camping trailer. We hope for your understanding in this matter. • Volunteers between the ages of 14 – 18 will be placed to the best of the volunteer coordinator’s ability but there is limited space availability and there are no guarantees of volunteers being placed. We would like to remind all of our volunteers to bring your own water bottle (BYOWB). The festival will not have plastic water bottles or plastic cups available on site, in an effort to cut down on single-use waste. Water stations will be available during set up and tear down week as well as over the festival weekend. Be environmentally friendly, keep hydrated and BYOWB! Note: Label your water bottle! Please bring sunscreen and a hat to the festival & shift. You must wear comfortable closed toe shoes while on shift! Please contact us regarding any mobility limitations. Our Volunteer Department will be happy to assist you with finding the best fit. If you are interested in volunteering at the Salmon Arm ROOTSandBLUES Festival, you must first fill out an online application form and agree to the waiver. The application link is available at the bottom of this page. By agreeing to the waiver you are stating you have read and agree to Salmon Arm Folk Music Society’s Volunteer Code of Conduct. Volunteer applications are will open late April. Duties will vary from crew to crew. Please read the crew descriptions for a general idea of what to expect. After you are accepted on a crew, your Head Supervisor will go over duties and expectations. It depends which volunteer crew you are on. How do I choose a crew? On your volunteer application please choose your top two choices and note your first preference. Please see the question above for a list of crews to choose from. New volunteers are placed on a first come first serve basis considering preferences as well as skills, interest and qualifications. Depending on the crew’s requirements, you may have to undergo an interview, certification or training before you are accepted. I have a friend who would like to volunteer! Great! We have a volunteer referral program where you can be entered to win prizes. 1) Get your friends to volunteer with you! Please see all the Rules & Conditions on your volunteer application. Please remember that we may not always be able to place them on your crew (depending on when they apply and available positions). The minimum age is 14. It is Festival policy that all volunteers between the ages of 14 and 18 must be the children of an active volunteer or be sponsored by an active adult volunteer who will take responsibility for them. The Festival reserves the right to determine who will be acceptable as responsible adults. The parent or responsible adult must agree to the Waiver and Release of Liability form before a minor is formally assigned to a crew. Volunteers under the age of 19 must be accompanied to the volunteer party by their volunteer sponsor. Once you are accepted on a crew, your main point of contact will be your Head Supervisor. Head Supervisors schedule your event shifts and depending on crew, sometimes your set up or tear down shift. If you have questions before you are placed on a crew, or can’t get a hold of your Head Supervisor, you can contact our Volunteer Department. I haven’t heard from the Volunteer Department yet? Please check your email’s junk folder before calling. If you have not received any emails please call 250-833-4096 and ask for the Volunteer Department. Is there a place for volunteers to camp? The festival offers weekend tent only camping to volunteers for the discounted rate of $30 for the weekend. Volunteers can reserve and pay for a volunteer camping spot by calling 250-833-4096 or stopping by 541 3rd Street SW, Salmon Arm. Camping is on a first come first serve basis, tents only, no showers, no pets but there will be water stations. No vehicles are permitted on the campsite however volunteer parking passes are available for the volunteer parking lot. If you wish to bring a camping trailer, please purchase regular camping at regular prices on our website. What are tear down shifts and how do I sign up? We ask all new volunteers to choose one 4 hour tear down shift, the week of August 19th to the 23rd, 2019. New volunteers are assigned a shift on a first come first serve basis considering preferences and festival needs. What if I am unable to volunteer and have been accepted and placed on a crew this year? Please contact your Head Supervisor and Holly, the Volunteer Coordinator immediately via phone AND email. Do your best to let us know well in advance of the Festival if your plans change. How do I confirm my intentions for 2019? We are require all volunteers to fill out a new application and attach a new photo. This step is required for 2019 as we are changing our volunteer management software. Please note: A new waiver is required for each and every year. Am I guaranteed a spot on my crew from last year? Returning volunteers who have filled out an application are guaranteed placement on their crews until May 15, 2019. After that date, they are still welcome to return, but may have to transfer to another area if their crew becomes full. I requested to transfer crews this year. When will I find out if I was accepted? Please choose a different crew when filling out the volunteer application. Your placement may take some time depending on the crew – some require interviews, certification, etc. Who will be contacting me about my crew? Once you have confirmed your 2019 intentions by filling out the online application form, the Volunteer Coordinator will confirm with you whether or not your application was accepted. Next, your Head Supervisor will contact you with further crew details. Why do I have to fill out a new form every year? A short application will be available in 2020 for returning volunteers. A newly signed waiver is required every year and is included in the online application. Thursday, August 15th – Sunday, August 18, 2019. How do I pick up my Volunteer Package? You will be notified how to pick up your volunteer package prior to the festival. Please direct questions to your Head Supervisor or at Volunteer Services located near the main gate. How early should I arrive for a shift? It is expected that you arrive 15 minutes early to each shift to help facilitate a smooth shift transition. I can’t volunteer anymore, what do I do? Tell your Head Supervisor immediately via phone AND email. Failure to properly notify your supervisors may result in removal from the SAFMS volunteer program. I’m going to be late or miss a shift, what do I do? Tell your Head Supervisor immediately. You should send a follow up email to your Head Supervisor and CC volunteer@rootsandblues.ca. Failure to notify your Head Supervisor may result in volunteer follow up and possible removal from the SAFMS volunteer program. Is there a map of the Festival grounds? Please check at the Volunteer Services for directions. Volunteer Services is located near the main gate. A meal is available to all volunteers for each day. Friday, Askews provides a meal and Saturday and Sunday each volunteer is provided with a Vendor Buck. Vendor Bucks can be used at participating Food Vendors for a meal. The Volunteer Lounge is open during the weekend to provide snacks, ice cream, coffee and tea. To pick up your meal vouchers please go the Volunteer Kiosk located in front of the Volunteer Lounge. • Vegetarian and meat options are always available. • Your volunteer ID name tag is your meal ticket, and is punched as you pick up your meal voucher. • Allergies! You must be diligent about monitoring your own food. If you are unsure of ingredients, please ask. If you have severe allergies, you may wish to bring your own food. • In an effort to reduce waste, drinking containers are not provided. • Please bring your own reusable water bottle and mug. Can I eat or drink on shift? We ask volunteers to eat before or after their shift as most shifts are only 4 hours long. If you would like to snack, please be prepared and bring your snacks with you to your shift. Always bring a water bottle with you and stay hydrated. Please do not consume alcohol before or during your shift. You must remove your volunteer t-shirt before consuming alcohol.